Treat yourself to a moment of relaxation thanks to the Finessence Organic Bergamot Essential Oil! Ideal in atmospheric diffusion, its delicate scent of citrus fruits and flowers gives you a feeling of well-being and fullness. It helps to let go and soothes the mind for more serenity. Relaxing, it promotes sleep and improves the quality of sleep. In cosmetic care, it is used for its purifying and astringent benefits. It makes the happiness of the skins with problems, dermatoses and greasy hair. 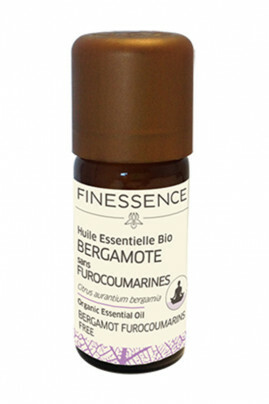 Finessence Organic Bergamot Essential Oil brings you joy and optimism everyday! Atmospheric diffusion : Respect the dosage and diffusion time indicated in the manual of your device. Infusion : Dilute 3 drops on a piece of sugar and add it in 1 liter of lukewarm water and not boiling. The essential oil of bergamot has a biological composition! Citrus aurantium bergamia (bergamot) fruit oil, linalool*, limonene*, citral*, geraniol*, citronellol*. Contains: Limonene, linalool, alpha-pinene, beta-pinene. May cause an allergic skin reaction. Flammable liquid and vapour. Causes skin irritation. May be fatal if swallowed and enters airways. Very toxic to aquatic life with long lasting effects.